On October 1, 2004, Hasumi Village (羽須美村), Mizuho Town (瑞穂町) and Iwami Town (石見町) merged to form the township now known as Ohnan (邑南町). The Chinese characters signify combined virtues of the three previous municipalities: “Oh” (おお or 邑) means a small district where many people are gathered; “nan” (なん or 南) conveys rich produce cultivated by warm-hearted people, a bright image of harmony and providing dreams and hope for the future. 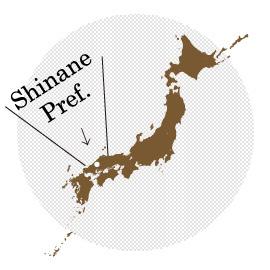 A trip to Ohnan is a special opportunity to visit one of Japan’s most historical prefectures - Shimane. Ohnan Town is nestled in the countryside of Shimane Prefecture in the Chugoku mountain range. Located just an hour’s drive north of Hiroshima city, it is the perfect location to escape the crowds and get a real taste of rural Japan. Ohnan has roughly 11,000 residents and strong roots in agriculture, which can be seen in the extensive rice terraces and dedicated efforts to organic farming. Travelers can explore varying landscapes, from lush mountains to characteristic basins carved through decades of silver and iron mining. Some areas of Ohnan, such as Hasumi, range in altitude from 100 to 600 meters above sea level, while others such as Mizuho and Iwami are distributed across the tall precipices with geographical features as high as 1,000 meters. Ohnan is particularly known for its fresh food. The term “A-Class Gourmet” coined here exemplifies the town’s farm-to-plate philosophy and produces a taste that truly can only be experienced here. The warm-heartedness and care put into the meat (such as Iwami pork and wagyu beef), rice and vegetables can be savored in every bite. With abundant history, fresh countryside food, traditional events and more, Ohnan is a prime destination for experiencing authentic countryside life in Japan. Your adventure is waiting. Are you ready?